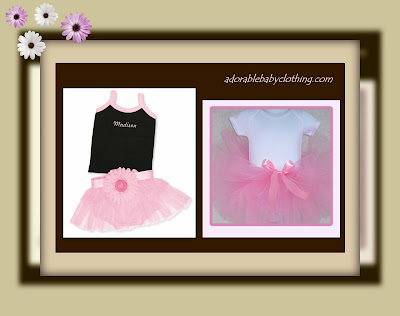 Looking for Tutu's for your little princess? If you follow my blog, you know how much I write about www.adorablebabyclothing.com. I fell in love with the clothing selection as it was of high quality and I think my first purchase was the adorable pink bunny Halloween costume for my then baby. I just purchased matching Christmas dresses to take them into www.thepicturepeople.com for their Christmas portraits. As I was looking for the latest and greatest, I stumbled on this incredible array of tutu's. The one above in a ladybug theme is so creative and unique. It has crystal eyes and Swarovski red crystals trailing giving it a delightful, shimmering look. It's available either in a onesie or tee. This is a gorgeous edition to any girl's wardrobe and makes quite the birthday outfit! There are a variety of birthday specific tutu's as well. There are some that are age specific and others that are not. The one above I used as an example sparkles with Swarovski crystals in which you choose the age from 1 to 8 and crystal color. It looks amazing to me! Cup Cake Tutu Set - Pom Pom Tutu: The Baby Pink Tutu is filled with a colorful mix of pink, blue and lime Pom Poms, and finished with a big colorful cupcake bow. Any little girl would LOVE this Tutu! Elastic waist, tutu length is approximately 8"-9" long, and can be adusted shorter or longer upon request; pin on bow is removable. Onesie or Tee..our Baby Pink onesie or fitted tee is embellished with a cute cupcake design in sparkling Swarovski crystals of pink, blue and lime, and topped with the birthday girl's age in sparkling pink crystals. This one would be one of my favorites because we have a house full of Johnny Depp Pirates fans. 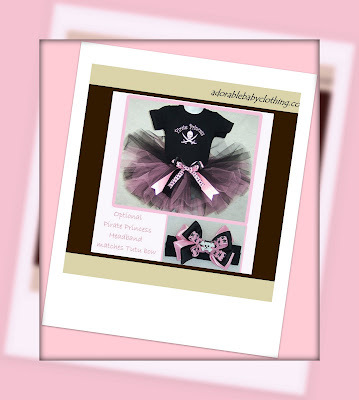 Onesie.. our black onesie with Pink Pirate Princess design on front and Jolly Roger design on baby's bottom pairs perfectly with our Punk style Tutu. Tutu.. Punk style Tutu has 8 layers of black and pink tulle; fantastic pin on bow is layered with black, pink and skull design ribbon. Tutu has elastic waist and is approximately 8" in length and fits babies through age 2. It even has a matching headband you can purchase. The sizes range from 6 months to 24 months. If you are looking for a unique, high quality Christmas present, birthday gift or just because, you won't be disappointed!